rif’s parents persuaded me to join them for dinner in Kepong last Sunday. I wasn’t in the mood, as I felt tired and achy all over. But they were so nice to me, I couldn’t say no. If you were to ask people what’s good to eat in Kepong, they would probably mention De Foodland. Since his brother made a reservation, we were seated the minute we arrived. The food came quite quickly, but throughout dinner, we could hear loud thuds and clangs coming from the kitchen. I wonder if the cooks were overworked that night. *LOL* I’ve never eaten here before, so I relied on the captain’s recommendations and ordered accordingly. 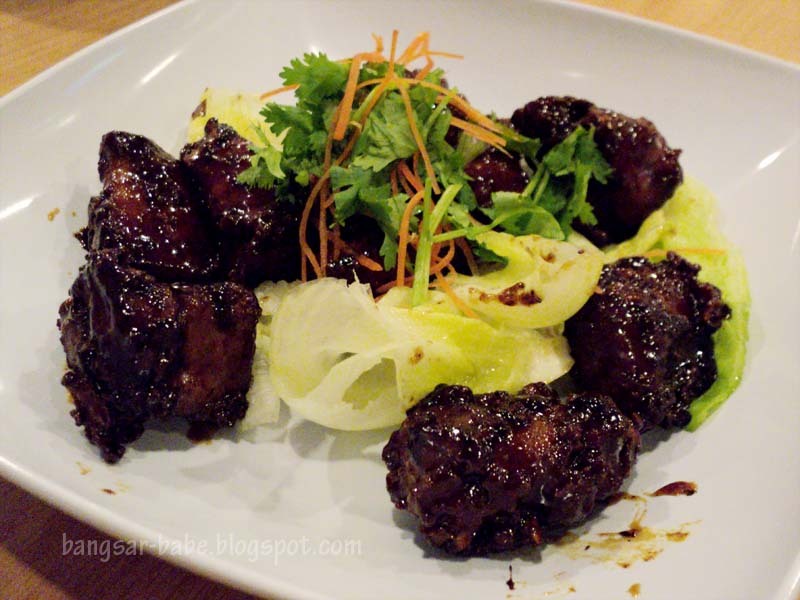 Black stout spare ribs were redolent from the stout with a thick, caramelised coat. But for RM15 per serve, the portion was scant. 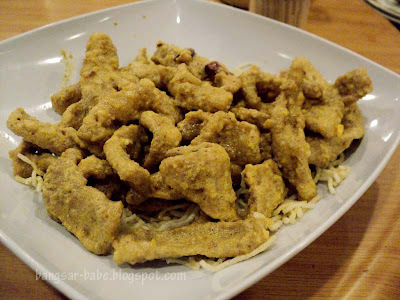 While the ‘Foodland Special’ Mango Chicken (RM15) was decent, it was nothing interesting. It was however, well prepared. The chicken was crispy, and the mango sauce had a good balance of sweet, sour and spicy. Ginger Paste Grass Carp (RM45) was delicious, and I don’t even like fish to begin with. Correct me if I’m wrong, but I think grass carp is called “wan yue” in Cantonese. The fish was smooth and firm, minus the muddy smell I cannot stand in fresh water fishes. That said, it was the pungent and fragrant ginger paste that complemented the natural flavour of the fish. Pepper salt mantis prawns were lightly flavoured and very moreish. Some places camouflage their prawns with a lot of batter, but this wasn’t the case in De Foodland. There was a good balance of batter and prawns. 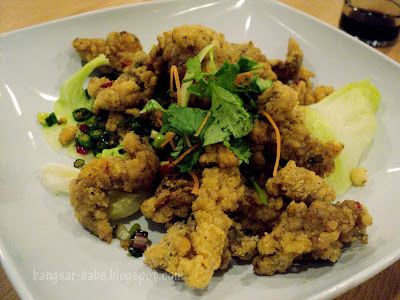 I expected the salted egg yolk squid to come with a crispy batter, and was slightly taken aback by the appearance of this dish. It didn’t look appetising, if you asked me. Tastewise, it was alright. Different from the version I’m accustomed to, but I prefer the original version. 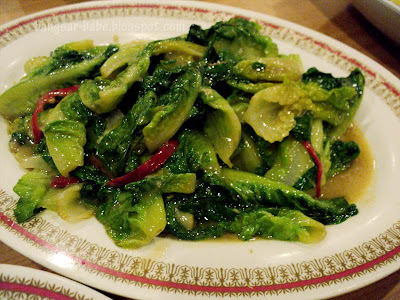 Stir-fried lettuce with fermented beancurd (fu yue yau mak) helped offset the cloying feeling after gorging on the squid and mantis prawn. 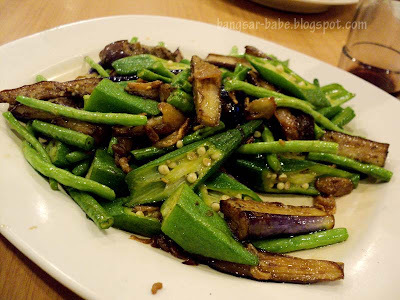 If you follow my food reviews closely, you would be able to tell that this is my default vegetable dish. 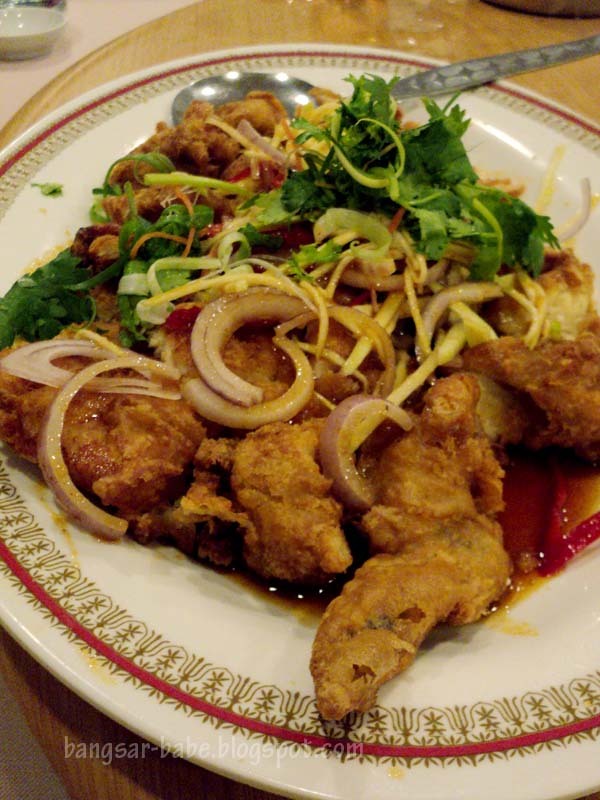 Four Heavenly King was ordered non-spicy, because one of us couldn’t take spicy food. Without chilli, dried shrimp and belacan, it tasted a bit flat. I’m used to eating my food spicy and fully flavoured. 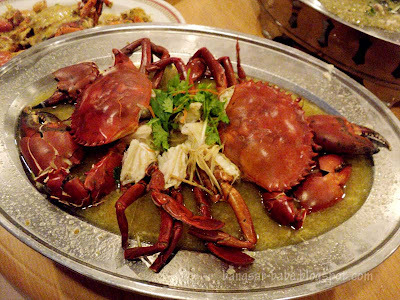 Cantonese style steamed crab (RM47 per kg) was a nice change from the usual kam heong, sweet & sour and kung po crab. This was doused with plenty of rice wine and julienned ginger. The clear gravy was sweet and slightly spicy from the ginger. I liked the creamy butter crab (RM47 per kg) better. The sauce was thick, rich and flavoured with pepper and spices. A pity there was not much sauce to enjoy. All in, the food was decent, but some of the dishes were a tad small. Going out for dinner did cheer me up a bit. Since it was a new camera, his parents actually told everyone not to touch the food until I’ve taken a good picture of each dish! Verdict: Decent food, but prices are slightly on the high side. I stay so near yet I never come here for dinner lol. 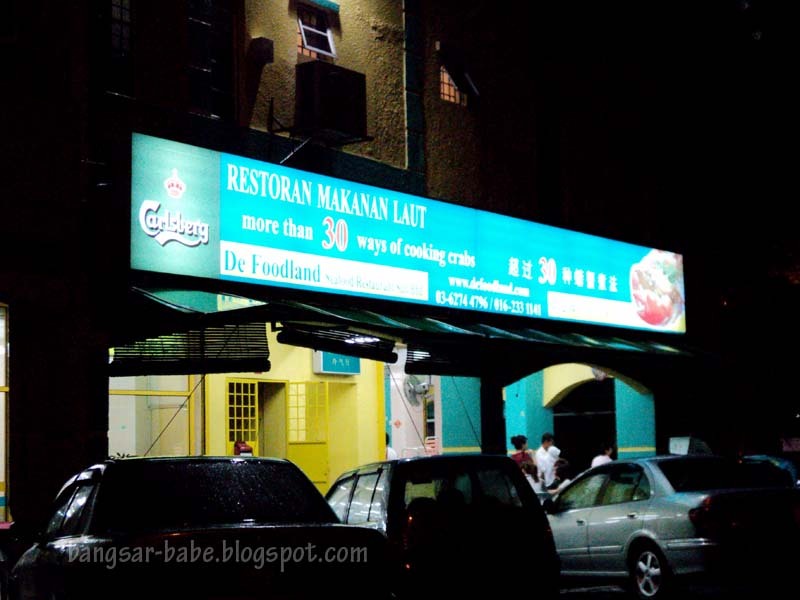 i've only ever eaten in kepong twice, and yeah, this is one of those two/three places i visited! there are a lot of hidden gems in Kepong! you just have to be more adventurous 🙂 I knew it coz Jenn used to stay with her aunt in Manjalara a few years back. 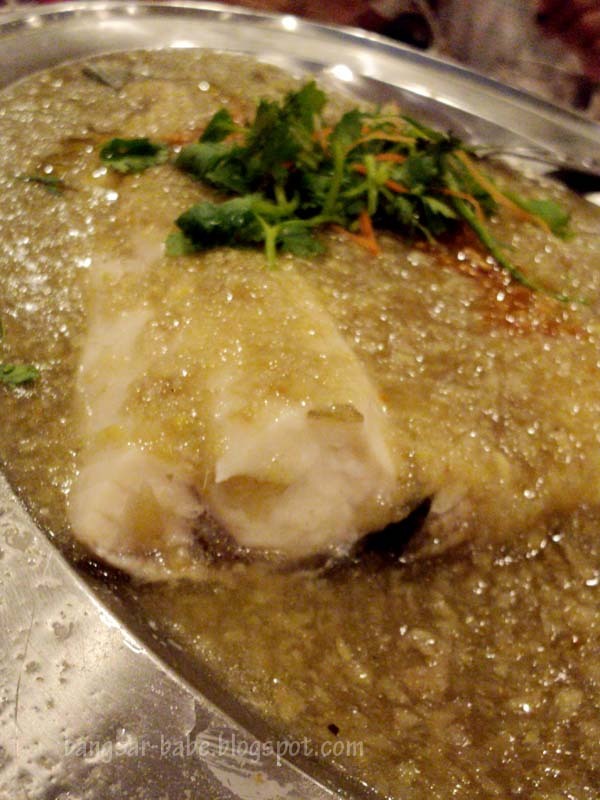 about the grass carp or what you called "wan yue".. they used ginger paste for a reason 😛 because most wan yue have those muddy taste that we absolutely hate. One of the better place for crabs. But the crowd is maddening during weekends! Aww Rif's family sounds absolutely darling to you! Hope you've cheered up a bit babe. Good to know you're back in eating form! worldwindows – Ya!! Good thing we booked in advance. J – It was good…but so kiam siap la they all! Sean – LOL…I must take you exploring! 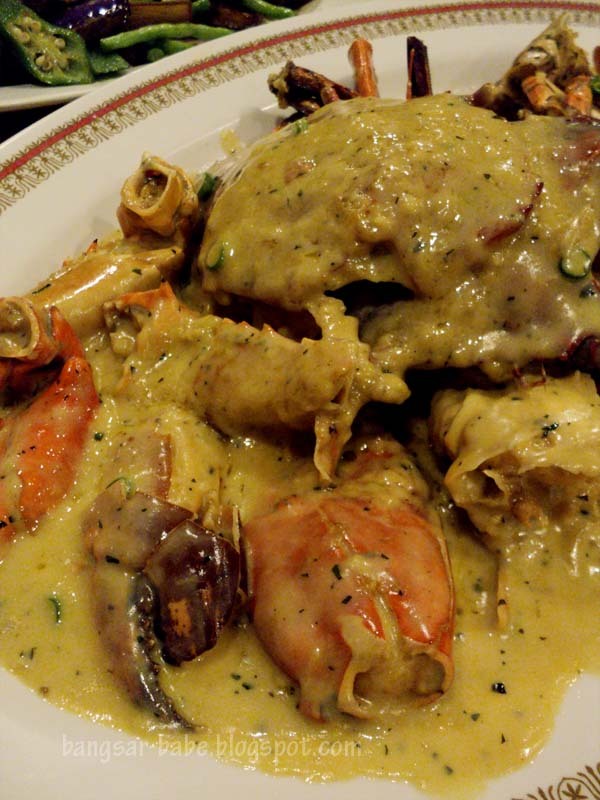 notice that the color of the crabs a bit brownish..the fried effect.